Operetta was tailor-made for the tastes and habits of the turn-of-the-20th century consumer of refined amusement. For middle-class audiences hankring for an evening’s lyrical entertainment, the boisterous attractions of the Bowery were too rough-and-ready (and perhaps unfortunate reminders of whence they came), and the opera boxes of the Metropolitan Opera House (between 39th and 40th streets) or the Brooklyn Academy of Music were available only to the select Four Hundred of Mrs. Astor’s circle. Operetta provided a fanciful in-between world of romance and escape; it was the most popular brand of musical theater for the first two decades of the 20th century. Americans in the 19th century usually took their cue from Europe and England when it came to musical entertainment, and the comic operettas of Gilbert and Sullivan, as well as those by the French composer Offenbach, enjoyed an enthusiastic vogue in the 1870s and 1880s. Soon there were many American versions or imitations of these shows, and operetta — original or, even better, imported — developed into its own successful genre. Operetta didn’t ask much of its audience in terms of both scale and score; “opera lite” always promised a happy ending. There were big romantic shows, where the score was accessible and soaring, the tenor and the soprano took center stage, and a supporting cast included incongruous comedians and a large male chorus. The setting was usually some exotic European country, a mythic utopia, or a combination of the two. In operetta, it wasn’t simply a question of boy meets girl, but rather prince meets gypsy girl or duke meets countess. New York’s infatuation with operetta would reach a kind of fever pitch in 1907, when Franz Léhar’s “The Merry Widow” — already the toast of Vienna, Paris, and London — arrived on these shores and swept the Broadway public off its feet by creating a mania not only for its music but also for various fashions inspired by the operetta’s eponymous heroine. But 13 years earlier, a composer of protean proportions had already made the reputation of the home-grown American operetta. Victor Herbert, like most of the successful operetta composers of the era, was an immigrant; born in Ireland and classically trained in Germany, he got his education playing the cello in some of the most highly regarded orchestras in Austria and Germany. Sheet music cover page of Victor Herbert's "Ah! Sweet Mystery of Life." Unfortunately, Herbert’s tunes were more memorable than the work of some of his lyricists: “Ah! sweet mystery of life, at last I’ve found thee” doesn’t seem particularly moving now, but the song proved integral to its show, “Naughty Marietta” (1910), where it actually figured into resolving the plot — a rare occurrence in operetta. The show itself is generally regarded as the first operetta set in America. Operetta is an easy target for mockery, but Herbert gave his musical scores an integrity and rhapsodic fervor that would long outlive the productions of his shows. The romantic appeal of the operetta made it, along with the revue and the musical comedy, an integral part of the American theatrical scene at the beginning of the 20th century. But then it came to a crashing halt. Operetta was doomed to temporary obscurity on June 28, 1914, the moment two shots rang out halfway across the world in Sarajevo, Yugoslavia. With the assassination of the Archduke Franz Ferdinand, war broke out in Europe, and no one was interested any longer in the romantic escapades of fictitious mittel-European aristocrats when real ones were being killed. 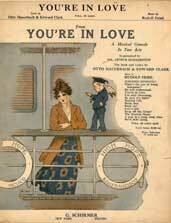 Sheet music cover page for Rudolf Friml's "You're in Love"
But, as patriotic passions cooled in the 1920s, there was a resurgence of the operetta, and several new players entered the game. Rudolf Friml was a piano virtuoso from Prague who immigrated to New York in 1906, and Sigmund Romberg, a disaffected architectural engineer, arrived from Bucharest in 1909. Despite their nobler callings, both men were quickly swept along in the currents of musical theater, crafting sweeping melodies for various interpolations and operettas for producers like the Shuberts and Arthur Hammerstein. 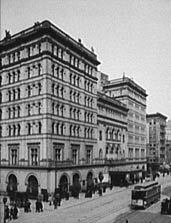 As the 1920s began, both men had already had several hits under their belt, but their luck came through when they started working with lyricist Oscar Hammerstein II, the grandson of the man who created the theater district, who was given a job by his Uncle Arthur stage managing one of his operettas. As Oscar worked his way through the Hammerstein organization, he learned about craft, lyric writing, construction, and the general architecture that goes into creating a piece for the stage. Hammerstein began his collaboration with Friml in 1924 (Uncle Arthur had given Friml his big break with “The Firefly” in 1912) on “Rose-Marie,” an elaborate operetta set in the Canadian Rockies. In all of his collaborations with Friml and Romberg, Hammerstein brought something new to the party, some aspect of construction, plot, or setting that gently nudged the operetta form into being more poignant or more pertinent. “Rose-Marie” (1924), better known to audiences through the oft-parodied Jeanette MacDonald/Nelson Eddy movie of the same name (where he’s “calling yoo-oo-oo-oo, oo-oo-oooo”), had a uniquely North American setting and managed to weave murder and revenge into its plot. Rex Harrison and Julie Andrews in "My Fair Lady"
Romberg and Friml had their share of other hits (“The Student Prince,” “The Vagabond King”) with other lyricists, but the shows with Hammerstein can be seen, apart from their pure rhapsodic pleasure, as early experiments in expanding the conceits of the romantic musical — as opposed to the musical comedy — form. The librettos themselves do not quite stand the test of time; they tend to overdose on injections of testosterone, and modern audiences prefer their heroism less on the nose and their romantic episodes with more psychological complexity.